7.12 points at 17 votes (rank 324). Somewhere in the shimmering sand of the desert hides a mysterious sanctum. A concealed tomb which has been forgotten and not been entered for aeons. The late Pharao who was buried here in the vast underground chambers was the 16th and the last of an enormous dynasty. His treasures, the gold, the artworks, the jewel-covered holy scarabs, all this is with him in the untouched chambers. Before his death, the Pharao vowed that he himself and his assistants from the underworld will protect his treasures from everyone who dared to enter his grave. But now you are here, you have taken on you strains for many years to find this last resting-place and so you climb down into the chambers of the tomb and hope that you will survive the deadly traps and the unexplainable ghostly appearances, to be able to steal the treasures. . .
A very early game from the beginning of the C64. Of course the graphics does not utilize all the abilites of the C64, there is no scrolling but the next screen is shown when you reach the border of the screen, if you take the year of release as a measure this is of course acceptable. 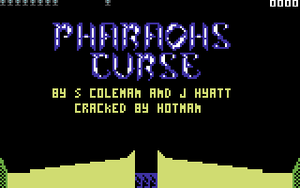 Concerning the music, there is unfortunately not much that Pharaoh's Curse offers, but at least the music snippets and FX fit the corresponding situations very well and create an atmosphere. 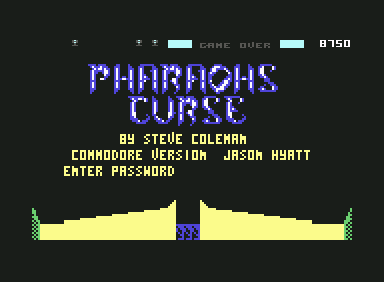 After loading and starting the game, you are in the title screen and the prompt "ENTER PASSWORD" "OR PRESS FIRE TO BEGIN" can be seen. After some time a demo is shown which can be aborted with the key "F3". By typing the password "blindly" you can start level 2 or level 3. By pressing the fire button in the title screen the game is started. At the beginning our tomb raider appears above the tomb at the entry shaft. You control him with the joystick in port#2. Jumps or falls from any height are not dangerous. The Pharao crosses the vault for ages. He cannot be killed, but he dematerialises after a hit and reappears at another place. Touching the Pharao is deadly. The Mummies act similar to the Pharao. They can also be moved to another place by shooting and also a touch of them ends deadly. The winged revenge. This bird-like creature can fly through solid walls. It cannot attack or get dangerous in a similar way, but it will grab you in random intervals and put you down at a different place in the tomb. The traps are hidden in the walls. They are either triggered by touch or in certain intervals. This always ends deadly. The keys can be found in different places of the tomb and serve to open hidden passages. They are collected by walking over them. The ownership is shown by a pulsing of your tomb raider. The 16 treasures are also placed at different spots and are also collected by touching them. The treasures that still have to be collected are shown by markers at the upper left of the screen. For each collected treasure a marker is removed. You get an extra life for each treasure. The ropes can be climbed. For this stand directly below a rope and pull the joystick forwards. The crown and the arrow materialize randomly at different places. Touching the crown gets you an extra life, touching the arrow does the contrary. Watch out for the “winged revenge”, it is very displeasing to be captured by it and then be put down again at an unfitting place in the underground chambers. H.T.W: “Due to the graphics, this game does not look very promising at the beginning, but the atmospheric sounds and the music snippets create a real “tomb raider atmosphere“. After some time playing you are drawn directly into the happening. Only this “winged revenge”, this damn bird, which most of the time grabs the tomb raider just before the last treasure and places him surely not where you would have liked to be, I really would like to wring its neck, if I could ;) ". 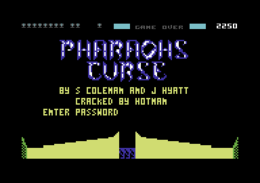 Robotron2084: "Pharaoh's Curse is not an eye candy, but the insane speed that is presented here renumerates for this. There are almost no calm moments, you rush breathlessly from screen to screen, jumping wildly, climbing and shooting, and the screen lifes melt away in seconds. But you should not expect originality as enemies here, except for the damn bird, as very appropriately named by H.T.W. The title tune is unbearably shrill, the ambient sounds in the game on the other hand are the more pleasing. 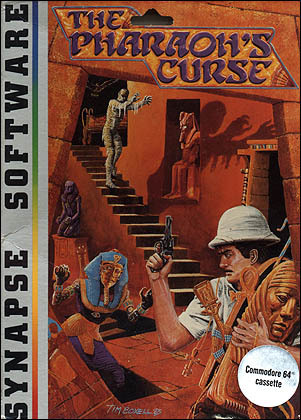 But for me the game is not one of the “big ones” by Synapse Software as e.g. Blue Max or Fort Apocalypse but rather mediocre. 6 out of 10 points." This page was last modified on 18 August 2016, at 03:39.